This week sees the return, of the popular republican magazine Iris. 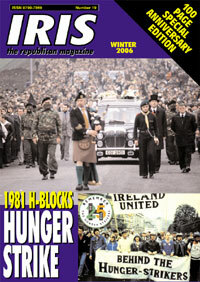 Relaunched by Republican Publications, the first new edition is a 100-page special on the 1981 Hunger Strike featuring rare photographs and interviews with participants. There is a limited print run (only 1,500), so Sinn Féin cumainn and individuals should place orders now!